There is a MODERATE avalanche danger today for both wind slab avalanches and glide avalanches. Lingering wind slabs (around 6-12" thick) will be possible for a person to trigger on steep slopes at the upper elevations. Additionally, an increase in wind this afternoon may begin forming fresh winds slabs in the Alpine. At the mid-elevations (1,000'-2,500') glide cracks continue to release. Limiting, or avoiding, any time under these cracks is recommended. 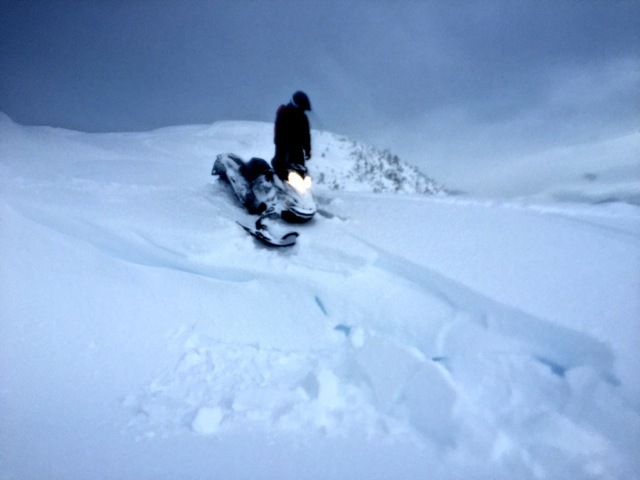 The Hatcher Pass Avalanche Center has updated the information regarding a snowboarder buried and killed in an avalanche Saturday. You can view their report HERE. Our condolences go out to the family and friends of the victim. We also would like to extend a heartfelt ‘Thank You’ to the many people who participated in the prompt rescue efforts. Saturday night brought a brief 'refresh' of snow to most areas in Turnagain Pass and Girdwood Valley. Around 3" of wet snow fell at 1,000' (which is now capped by a crust) and 6" of low density snow at the higher elevations above treeline. Moderate to strong Easterly winds along the ridgelines accompanied the snowfall. It was no surprise to see shallow wind slabs along the Tincan Ridge yesterday. Although these slabs were present, they were quite stubborn and hard to initiate on test slopes. The wind slabs sit on old snow (broken precipitation particles) with buried surface hoar intermixed, essentially Saturday's surface snow. For today, Martin Luther King, Jr. Day, there are two types of wind slabs to watch for: Old and New. Old wind slabs: These older lingering wind slabs are in the 6" to a foot deep range. And, they can be tricky; meaning they may not release till you are well on the slope. They also may be obscured by a skiff of fresh snow. Quick hand pits and jumping on test slopes are good ways to suss these out. New wind slabs: We are expecting an increase in East winds later in the day. Keep an eye out for active wind loading. Any fresh wind slab should be touchy and release easily (as opposed to the older, stubborn wind slab). These also can form on top of one another. Photo below is Graham Predeger testing a fresh wind slab/cornice feature from the top of Seattle Ridge yesterday (credit: Sully). These small terrain features are good ways to test the snow without committing to steep avalanche terrain. After several days of glide cracks releasing on Turnagain Pass - some of which were 'front and center' on Seattle Ridge - there was only one new glide avalanche seen yesterday. This was a smaller glide on the South face of Wolverine Ridge around 1,500' in elevation. Again, we preach avoidance for this avalanche problem. Avoiding, or doing your best to limit your exposure time, under these glide cracks is advised. There are still many large cracks looming - most notably on the East face of Seattle Ridge and on the South and West faces of Tincan ridge. These are the two areas most easily accessed by backcontry travelers. Below is Heather's photo from Seattle Ridge on Saturday. You can clearly see the two glide avalanches from over the weekend as well as the looming brown crack on the next gully over to the right. With yesterday's 3-6" of new snow, many of these cracks are 'dusted over' and much harder to see now. Yesterday's weather consisted of mostly overcast skies, gusty Easterly ridgetop winds and warm temperatures (mid 30's at 1,000', upper 20's at 3,000'). Winds quieted down in the afternoon and have remained light from a generally East direction overnight. Warm air has been streaming in at the upper elevations overnight - Sunburst reported 32F at midnight, this station sits at 3,812'. Today, we can expect mostly overcast skies again with a chance for sunny breaks in the clouds. Later in the afternoon and this evening, the Easterly winds should pick up along with light snowfall (rain below 1,000'). Ridgetop winds are forecast to be ~15mph from the East. Temperatures should cool to the mid-upper 20's F at the upper elevations and remain around 30F at 1,000'. Overnight tonight and into tomorrow, an embedded low-pressure in Northern Gulf will bring a quick shot of snow above ~1,000'-1,500' with light rain below - accumulations look to be in the 3-6" range. Winds are expected to be 20-30mph from the East on the ridgelines and strong gap winds along Turnagain Arm.